In the South, they say "y'all." In Pittsburgh, they say "yinz." Here in Jersey and most other places, they say "you guys" or some variation of that. Let's face it: "you people" is somehow offensive. But every once in a while, when I use the phrase "you guys," I get criticized for leaving out the women folk. So let's just agree right here and right now that "you guys" currently means "you persons," "you humans," or "you (plural)." Just as Spanish words like "niños" can mean both male and female children together, or it can mean just boys. 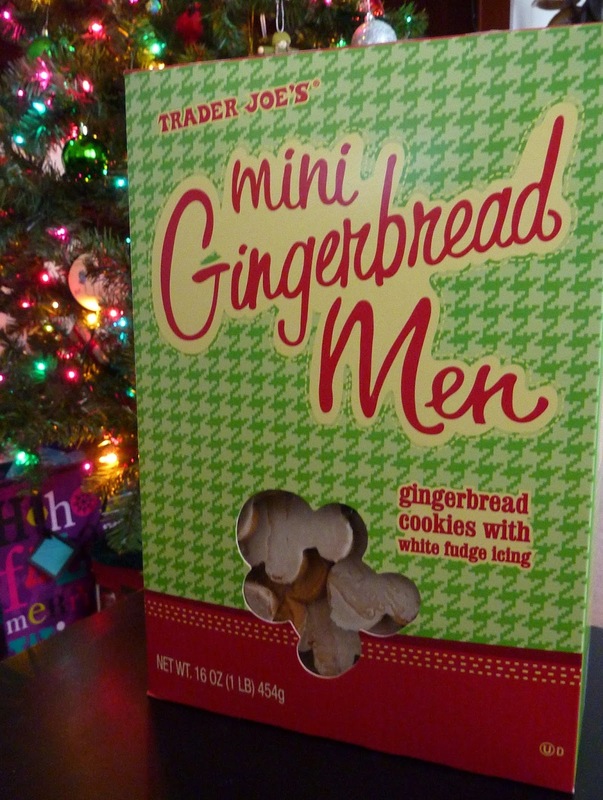 In that same vein, Sonia wonders why there can't be gingerbread women included in this box of merry holiday cookies. Why is it always gingerbread men? Or are we to assume they're genderless gingerbread persons? Sonia's whimsical musing isn't necessarily out of a desire for political correctness. It's more because she wishes to see happy cookie couples pairing off with one another to face the excitement and uncertainty of being consumed together, rather than solitary male cookies heading off to the great beyond all by their lonesome, like so many brave soldiers being whisked away to war. However, I sense that this metaphor will very quickly devolve into absurdity within the next few sentences here, so I'm going to abruptly transition to the actual food review. Ready? Here goes. The cookies are covered in white fudge icing. I like that. Finally, something NOT covered in dark chocolate. They're not too hard and not too soft. I like that, too. Their flavor is gingerbready, sweet, and spicy. There're enough gingerbreadish spices to warm the back of your throat slightly, thus prompting you to clear your throat excessively, which in turn may cause some slightly awkward social situations. Yet the cookies are good enough that you'll continue eating them, which may cause said awkward social situation to escalate into a nightmarish episode of outright public embarrassment. Not really. I'm exaggerating. But no seriously though, they really do kind of tingle at the back of your throat a bit. I'm not sure what it is about cookie butter that makes it so amazing. It tastes very much like gingerbread, but so much better. 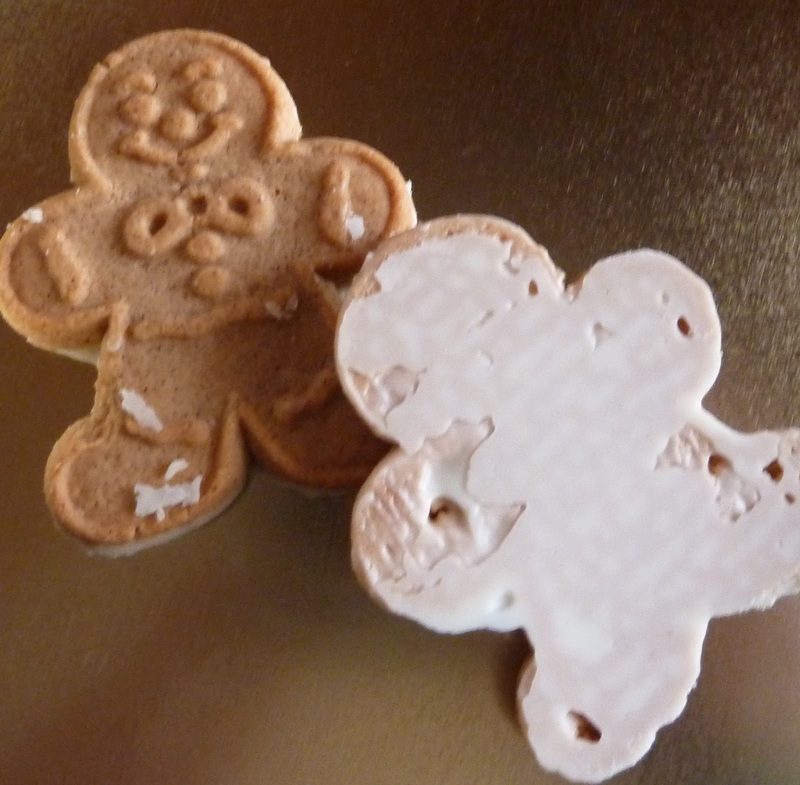 If we had any on hand, I would definitely try making gingerbread sandwich cookies with two of these little men and some cookie butter in between. As tasty as these cookies are, I can't really even put them in the same ballpark as most of those cookie butter products, score-wise. They're good, but they're not that good. Plus, I get hyper when I have too many cookies. Three and a half stars from me. Four from Sonia. You guys excited Santa is coming next week? These taste best when dipped in milk! Ooh! Good call. I'm gonna go do that right now, actually. We gobbled down two boxes last week. The hubby and kids enjoyed dipping (soaking) the gingebread people in TJ's organic hot cocoa. Definitely liked these cookies. BTW, I've lived in Texas since I was a little kid and I am a "you guys" girl all the way! I LOVED these this year, especially dipped into a nice cup of tea. I was very sad when I tried to buy another box and was told they were all sold out. Hoping they'll come back next year. And, yeah, very happy they were white fudge instead of dark chocolate, as I'm one of those rare people who usually don't care for dark chocolate.